On the way home from the movies I decided to drive through the "rich" section of my little town. The "rich" section is only one road over from my road, so I am close enough to spy on the rich and famous. LOL ok no one is famous. But they have some awesome yards. I suspect they use a landscaper, but I will give them benefit of the doubt, maybe they did all the work themselves. 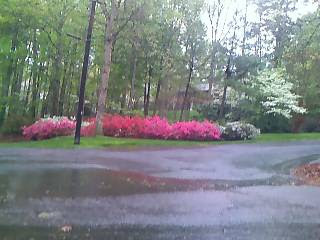 Anyway, its spring here and it really is pretty here in the spring in some places. Enjoy! I have been trying to get in a Bunco game here, but its hard because I have no friends. OK, I do have friends but they all live at least an hour away. But a co-worker got invited to join a Bunco League (are they leagues? I don't know) and even though this co worker really gets on my nerves I have been pushing at her to ask them if I can play. But yesterday she got really mad at me because I didn't ask her to go to the movies Sunday and she kept saying "I wont forget this, I wont forget!" So I guess my shot at a Bunco game is lost forever. I would start my own "league" but like I said I have no friends and it looks like I am one less now LOL. The funny thing is another friend (OK I am disproving my theory that I have no friends but really I don't LOL) texted me late Saturday night asking if I wanted to go to the movies, so it wasn't my place to invite other people. Geez work is just like high school anymore!!!! p.s. I would totally play Bunco with you, I really want to join a league too! maybe some of your rich neighbors would play with you I used to play with my neighbors. What movie did you see? I guess those are azaleas. Beautiful, I wish I had those. Or even some shade to grown them in. You didn't invite me to the movies either! I won't forget this! I have heard of Bunco, but I don't know what it is. Cards, I think. 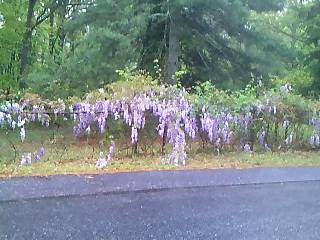 The flowers are wisteria, there is alot of it growing wild around here. I love them but they dont last long. The other flowers are azaelas, which always make me sad. My dad was quite the gardener in his younger years and he LOVED azealas. Bunco is a dice game, its easy and fun but you need at least 12 people I think. Maybe you could start a bunco group in the neighborhood. Ok, that girl is petty. She needs to get over it. I can't handle drama like that. I love all the pretty blooms in the Springtime too! Your pics are gorgeous!